parentwin: Guest Post - Mama, Will you Read Me a Story? Today's guest blog comes from Sascha Fink, regular contributor to The Past and Future Tense, The Blog of Preterite. She is the mother of two girls, one in elementary school and one almost an adult. Her family reads regularly, and here's how she got them into the habit. Great tips on making reading fun and rewarding for life. Oral reading through history has been vital to the evolution of society. It was first and foremost a means of enculturation. The cultures, belief, folktales, laws and mores of a society were passed to each generation through the stories that were told. Myths, as they are properly defined as sacred stories, transferred the ideas of religion, spirituality and the knowledge of the natural world. Oral stories and teachings also taught the younger generation about their own family history. Even when stories began to be written down on paper, oral storytelling did not end. Literacy was not commonplace. Even though moveable type had been innovated in the 15th century making books easier to obtain, it wasn’t until the Industrial Revolution of the mid-19th Century that books were cheap enough for lower classes to purchase. Even with the advent of affordable books many were still illiterate and stories were often read orally so that many could enjoy them. There are methods to achieving reading fluency. The first method is modeling. As a parent it’s important to be a good model for your child. I always tell people to let your child see you read a book. They don’t need to hear your story but they need to see you sitting down turning pages and appearing engrossed in something other than the computer or the television. Children model the behavior of their parents and other adults that are close to them. I have seen this behavior in my own child. I nursed my seven year old. I nursed my 20 year old. Almost every friend I have has been or is a nursing mother. I don’t ask them to cover up or nurse in another room when my daughter is present. My seven year old was given a baby doll when she was three. It came with a bottle. I encouraged my daughter to feed her baby assuming she would pick up the bottle. She pulled up her shirt and put the baby to her precious little body. I was amazed and then remembered, she had never actually seen anyone use a bottle before. We were her model for action and behavior. Modeling should be strong at home. Think of it as assisted homeschooling for beginner readers. In school, most often oral reading is done by students and as a parent you can’t guarantee that the student reading will be a good model. If you have a good teacher he or she will read orally during some sort of story time. Hopefully he or she will read aloud for as many subjects as possible. Unfortunately when oral reading is requested of each student during reading periods, your child might have more exposure to the poorer readers in her class than to their fluent teacher. Reinforcing good oral fluency at home is key. She has to be able to determine which is correct. When children are able to sit still for just ten minutes you begin to read to them orally. This happens as early as one or two; perhaps the average being around three. This is another early step toward reading fluency. Fluent silent reading is a direct result of oral fluency. When hearing a parent read, even the simplest of stories, the child begins to learn inflection, dialogue, proper flow and cadence, proper punctuation pauses and every other reading technique that increases comprehension. Early readers often ignore end punctuation continuing on to the next sentence. While this is a typical early reader mistake, its source is lessened a bit if you allow your very young pre-reader to read along with you as you point to the words. They will begin to notice that a (.) means “stop.” They will learn that a (“) means someone is talking. They will learn to recognize that a (,) means “pause.” They won’t know what the symbols are called or what their technical uses are but they will begin to match them with actions. Dialogue is something parents should pay particular attention to. You must set it apart from the story to make meaning. Read the following statement without quotations or punctuation other than a period: I like to eat pie. He took the pie from the shelf and cut a slice. That was good he said. No one can deny that it takes effort to read that sentence with any sort of involvement; especially if you’re reading to a three year old. Now put a little life into it. “I like to eat pie!” He took the pie from the shelf and cut a slice. “That was good!” he said. It’s just a little better. Now give the dialogue a voice other than your reading voice, say it a bit louder, and make a funny face when you read it! I can imagine some sort of Sesame Street Muppet voice. I can guarantee you will have a child whose eyes open just a little wider when you read that particular line in that manner. The second method to oral fluency is repetition. Read that story over and over and over again if they want you to. I can’t tell you how many times I’ve read “There’s a Wocket in my Pocket” by Dr. Seuss. I know that there is a Zofa on the sofa and that there are Ghairs under the chair. I’m well aware of the Yeps on the steps and the Yottle in the bottle (and I’m reciting this from memory even though I haven’t read it, thank goodness, since we moved on to The Magic Tree House and The Weather Fairies). Encourage your child to summarize each section as you read it, or in the case of longer book, what happened when you left off. Reading fluency matters little if there is no memory or comprehension of the story. When your child is old enough to read on their own, have them repeat sentences when they have trouble with the flow. If they miss a break, point it out and make them read the sentence correctly by asking them to “try it again and remember a period means to stop.” If need be, read the sentence to them and slightly exaggerate the pause and proper inflection. Be very aware of accuracy and self-correction. If your child is reading inaccurately, give them a moment to see if they self-correct (this is a very important skill) and if they don’t, gently correct them and ask them to read the passages again. Encourage your child to stop if they are unsure of a word and either ask you for a definition or help with pronunciation. Don’t just pronounce the word. Let them do it. Break the word into syllable with your finger covering the next section of the word. If the definition or explanation of the word is in the next sentence, ask them to read on. Learning to use context to define words is important. A third method is choral reading. This is reading the words together aloud. Best done with simple stories, it allows your child to follow your tone, inflection and enthusiasm. Imagine that you are teaching a child how to draw a horse by putting their tiny hand on yours while you move your pencil about the paper. They might not be able to draw a horse to perfection for some time but they will always try to model the movements they felt while your hand moved along the paper. Reading with passion is perhaps the most important aspect of oral reading. You can work through a storybook line by line by line by line quickly. If it’s obvious to the child that you are trying to blow through the pages so you can get them to go to bed, it’s a wasted experience. In the beginning choose books that you like. It’s not particularly hard to go to the children’s section of the library and find something that interests you. A personal interest for tigers can lead you to several fiction and non-fiction books in which tigers are featured. If you like the book you’re more liable to bring your love into the story. Right now I’m reading “The Hobbit” to my seven year old. The world of “The Lord of the Rings” is very important to me. I do a fairly good Gandalf and a pleasing Bilbo but my dwarves need a little work. I have a fair singing voice so I put a little music into Tolkien’s song lyrics. I’m trying to read it the way I imagine it was written to be read. If you are reading books slightly above a child’s comprehension level make sure to adjust. I change British words to English words when necessary and when Thorin Oakenshield begins a fairly long diatribe about the loss of his people’s gold (yet again), I paraphrase. I’m bringing it down to an understandable level without losing the zest of the story. I can’t wait to see what she thinks when I bring in a replica of Gimli’s ax as a prop as I begin the Battle of the Five Armies. Show them passion and they will develop passion. They will want an Alice In Wonderland birthday party because you just finished reading it. They will be desperate to attend the Harry Potter and the Goblet of Fire midnight book release in costume (my daughter’s boyfriend…shown in the middle…won first prize in the costume contest as Snape and she and her best friend on the right were Death Eaters). They will find joy and happiness with the world of books. 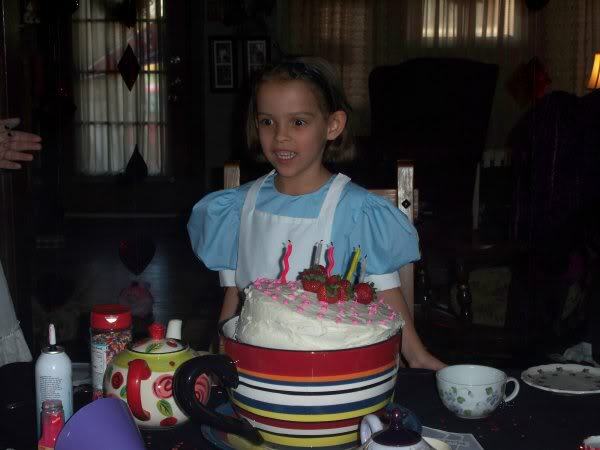 My seven year old's "Alice in Wonderland" costume birthday party. She was Alice, of course. When they grow a little older let them choose the book. My daughter loves cats. No, I mean she really loves cats. She had drawn no less than five thousand seven hundred and eighty two pictures of various breeds of cats in every possible setting and activity. She will tell every stranger she meets that cheetahs are different from other cats because they can’t retract their claws. She tells the librarian that they need to get more books on cats because she’s read most of the ones on the shelf. She helps me volunteer at a cat shelter and is quick to point out all of her cat knowledge to perspective adoptive parents. If your child has a similar, seemingly obsessive interest, go with it…all the way to the end. My daughter will find another obsession at some point (we’ve already been through dinosaurs, cobras, vampires and werewolves) and I’ll let her take me as far as she wants again no matter how tedious it might seem. Did you know that when a cobra opens its hood it’s actually spreading ribs apart to make itself appear larger and more aggressive with the intention of warding off an attacker? It’s probably more frightened than you are and will only strike when it absolutely has to (I’m not sure I want to test that theory). I didn’t know that until my daughter brought home a book and read the page to me three times in the first sitting. The most important thing for a parent to do is avoid frustration. Don’t give your child a book that is too hard unless you are reading it to them (and remember to paraphrase if necessary or change single words for easier comprehension…your child might not know what a loo is). If they are reading to you keep the book just a half a step above their current level. Look for books where your child will have to manage through only a few correctable mistakes. If they can’t understand the story or are stumbling on every other word it’s too hard. Either read it to them save it for them to read when they are more fluent on that level. If a child can read a story to the point of memorization, it’s time to get a slightly harder (or at least a different) book. As the parent of a school aged child, in this day and age of tests, labels, and processes, you’ll most likely hear a plethora of dollar words such as aligned materials, chunking, co-articulation, scaffolding, consolidated alphabetic, morphemic analysis, independent-instructional reading level range and Frayer Model. I’m not telling you to ignore all these technical terms…wait, yes I am. I was a reading specialist for lower level sixth graders and what I learned was scaffolding meant nothing more than the different ways you guide a student to the correct answer. We talked a lot about there here and not once did I use the fancy word. There’s no harm in learning what these terms mean if you want to and/or if they are pointed out to you via a teacher, but if you’re just trying to instill a love of reading skip the textbook words. Both of my daughters grew up with higher than normal reading levels for the majority of the children in their age group. My almost second grade seven year old reads at a mid-third grade level. It took some time but we just finished reading The Lady of Shallott by T.S. Eliot in its entirety. She wants a mirror in her room so she can look outside her window without breaking a curse. My older daughter read “The Lord of the Rings” when she was eleven years old (the same age I did). I never used one single fancy word or fancy technique. All I did was the things outlined in this post. Reading matters. Reading well matters. People who can read orally are more well-spoken and more confident than the average person and have a greater chance at college which in turn leads to better jobs. Reading well results in the ability to write and express oneself properly. Writers with oral reading fluency are more apt to read their work aloud and catch errors, poor flow, incomplete ideas or bad word choice. If it sounds bad there might be problems with the way it has been set to paper. Reading well encourages creativity, imagination, discovery, and language skills. Reading orally develops listening skills. Most important of all, reading with your child creates a loving relationship of respect and affection. Mommy? Will you read me a story? I will. Every single time you ask me. I will even when you don’t ask me. ____If you like this blog, please vote on Babble.com. Tales of an Unlikely Mother is number 17, just scroll down and click on the thumbs up! Thank you so, so much.